When you return from a trip and recall your experiences, you’ll realize that your take on a certain place or city depends, in large part, on the hostel where you stayed. At the end of the day — and often we’re talking about an exhausting, activity-filled day where you’ve been exposed to a new language, endless cultural interactions, confusion and excitement — you return to your home away from home: your hostal. And how you choose this “home” is worth considering. In the following blog, we’ll give you a few tips on how to choose the best hostel in Ecuador during your visit. Should I choose hostels or an Airbnb? In Ecuador’s major cities, and even in some of the smaller ones, you’ll find numerous Airbnb options. In fact, many of the options you’ll find on Airbnb are actually hostels and can also be found on websites like booking.com and hostelworld.com. We suggest you check out Airbnbs as part of your search and compare your finds using the same parameters used below to choose the best hostel. Just keep in mind that, oftentimes, Airbnbs are private and you lose the element of community that is more easily found at hostels. On the plus side, though, you might get a whole apartment to yourself, including access to a kitchen! This simple exercise helps you determine how to undertake your search for the best hostel in Ecuador. If cost is your top priority, and your maximum per night is $8, you’ll quickly be able to filter through the options available, focusing only on those that appear to match your preferences. Once you know your priorities (and these may vary depending on each destination and the activities you want to do, as well as your emotional and physical state), you can always refer to them to make sure you’re choose the hostel best suited for you. 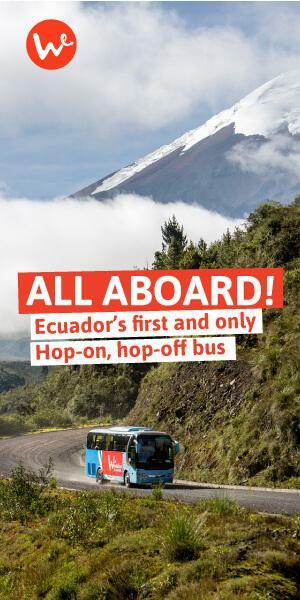 Ecuador is a budget-friendly destination and you’ll find many hostels in the major cities, as well as in more remote areas, that offer dorm beds starting at $6 and going up to $12 and $14, per night. If you prefer your own room, you might be looking at $14-$25 a night. Make sure to search on Airbnb since you may find better deals there for private rooms. Hostels usually charge per person, though some may charge depending on the type of room (Single, Double). And if you’re outside a city and prefer to camp, you might be surprised to find campgrounds charging $6+ per night, just to pitch your tent. In this case, it might make more sense to pay for a dorm bed than to camp. Location is everything when choosing the best hostel in Ecuador. Particularly in the bigger cities, like Quito and Guayaquil, location determines what activities you’ll do, the quality of food you’ll find, and how safe you’ll feel while exploring the city. It’s useful to know some of the best and worst neighborhoods in town, but that information is hard to come by before your trip unless you have a local friend. 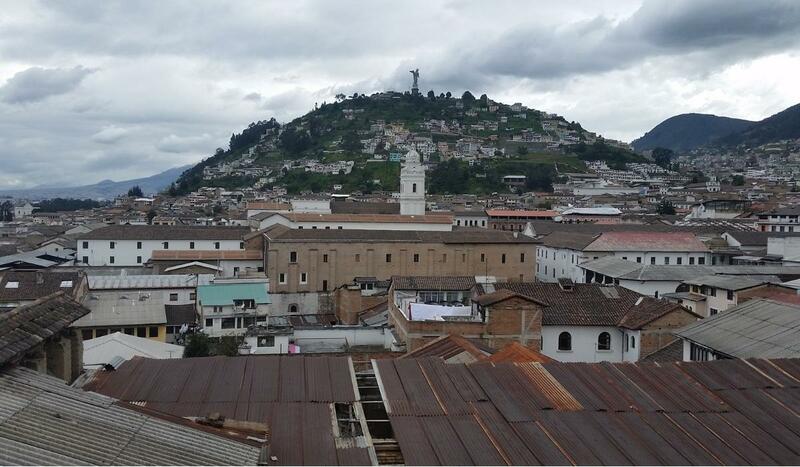 In Quito, there are a couple of neighborhoods with a high density of hostels that supposedly offer the best location. Located in the Old Town, San Blas offers tourists spectacular views of the city. Old Town sites are nearby so if you prefer to walk, this might be a good spot to look for a hostel. Also in the historic center, La Tola is one cool neighborhood. However, it has a little bit of a reputation regarding safety concerns. This is also true in San Blas, mind you, so just ensure you take safety precautions when staying in these areas. You’ll find a ton of hostels, restaurants, bars and discotheques in La Mariscal. Noise might be an issue at a hostel here, but if you’re out to party or just make a bunch of friends, you’ll enjoy staying in this neighborhood. It’s also right on the Ecovia line so it’s cheap and easy to get around the city. Located on Quito’s eastern slope, this bohemian neighborhood overlooks the valleys below. It’s a lovely area to explore on foot (though it involves a lot of stairs and you’ll likely be out of breath the whole time), and the views are spectacular. Don’t miss the graffiti as you head down the hill! Just above Guapulo, Gonzalez Suarez is the name of the road as well as the neighborhood. It’s an upscale residential area with coffee shops, a couple of bars and restaurants and, again, some incredible views facing the west and Quito’s surrounding valleys. There aren’t many hostels here so you might want to search on Airbnb. Closer to the heart of the city, this avenue and its surrounding neighborhood are also upscale and residential. There are many bars and restaurants to choose from here, and Parque La Carolina is nearby for the joggers among you. Again, make sure to check out Airbnb options since there aren’t many hostels. There are a few hotels, but they can be quite pricey. “Breakfast included” is always a major perk when you’re choosing the best hostel. Many places that offer hardy, delicious breakfasts get the best reviews. People love breakfast, it’s a fact of life! In Ecuador, though, you should consider how much “breakfast included” is really worth to you, especially since local Ecuadorian breakfasts, found on nearly every street corner, only cost $2. They include bread, cheese, eggs, freshly squeezed juice, instant coffee, and sometimes even a little fruit. Good deal. That said, some hostels have more tourist-friendly options like yogurt and granola, pancakes, good coffee (not instant) and other tasty things. When you read through the reviews, keep your eyes peeled for the word “breakfast”, but remember that there are cheap options just around the corner if your choice hostel doesn’t include breakfast. Solo travel is getting more and more popular every year. Everyone is all independent, self-sufficient and emo, reading their Kindles at coffee shops and gaining renewed perspective through their solo adventures. It’s almost a rite of passage these days and it’s important, to say the least, but there comes a time during your solo travels when you’ll want some company, a few laughs, and people to party with. In fact, we humans are wired to almost always prefer social situations over solitude. We’re gregarious little creatures and, for that reason, we usually need spaces that facilitate our gregarious nature. When you’re choosing a hostel, look for reviews and keywords that include “social area” or ”communal area”. In Ecuador, if you find a combination of “roof terrace” + “communal area”, you’ve hit the jackpot. Look no further, even if there’s no hot water. In all seriousness, hostels that offer social spaces are just more comfortable and warmer, overall. Especially if you’re staying in the dorm, it’s sometimes nice to have a second space that has chairs and where you won’t be invading someone else’s privacy (or listening to them snore in the bunk above). Find a hostel that is described as a “home away from home” in its reviews. You won’t regret it. Somewhat related to the previous point, finding a hostel known for its staff is another major plus. Remember that earlier comment about knowing which neighborhoods are the safest (or coolest)? That’s where helpful staff come in! They can recommend places to eat, local sights, activities in and outside of the city, security tips for women (or men), and more. Friendly staff makes the space warmer and more welcoming, so if you see this commented in reviews, take note of it. It may not be top priority for you, but is a factor to consider as you choose the best hostel in Ecuador. Depending on what you might be planning during your trip, access to a locker, safe, or really any type of reliable storage option can be useful. Perhaps you don’t feel like lugging all your possessions with you while you visit the Amazon rainforest (warning: electronics will get damaged due to high humidity). Some hostels will take care of your things, oftentimes under lock and key, until you get back. It’s beneficial to them as well, since it guarantees you’ll come stay for at least another night. Even if you’re just exploring the same city, having a locker to leave your passport, laptop and other valuable possessions gives you one less thing to worry about during your trip, especially if you’re bunking with strangers in a dorm room! Hostels that offer flexible, or later than average, check out times are more lovable. They understand how exhausting it can be to pack and unpack and feel homeless, even though travel is liberating in so many other ways. So if you’ve boiled your options down to two or three best hostels, checkout their checkout times and make your final decision based on that. Reviews have revolutionized the online shopping experience and are there to help you make better purchasing decisions. Don’t ignore them, but also know when to take them seriously. If a hostel only has a handful of reviews, it might not make sense to base your decision off of them. But, the fact that they only have a few reviews is already a warning sign, unless you’re headed to a remote region of the country. This almost didn’t make the cut because, seriously, what hostel in this current hostile (hehe) and competitive business climate doesn’t have wifi?! That’s unheard of. Unfortunately, when it comes to choosing the best hostel in Ecuador, free wifi is something to consider. Just make sure it’s mentioned somewhere in the amenities list and, if it’s not, move on. Humans can’t live without wifi. You might actually die. And that doesn’t sound like a vacation to me. Are you ready to start your search for the best hostel in Ecuador? 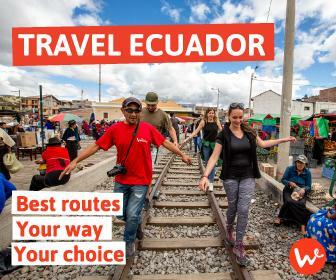 Check out some of our other blogs, which usually list our recommended hostels at each destination, like Cuenca, Montañita, Quito and more. Otherwise, visit one of the following websites and, remember, make sure you have your priorities straight!